It’s pretty clear your optics will play a significant role in hitting or missing your target. 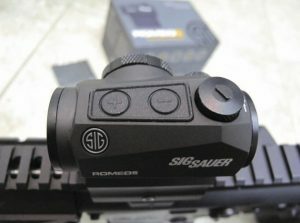 Having reviewed some of the best red dot optics, I think it is worth considering the romeo 5 from sig sauer. It’s well built and features a number of cool features that can really transform your hunting or experience at the range. 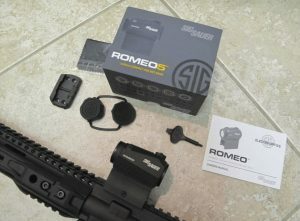 So let get’s down to the Sig Sauer Romeo 5 review and find out why it’s a good idea to get yourself one too! What immediately stood out to me was the lightweight design of this red dot. This is beneficial because you can take it everywhere where you go with much ease. It’s enclosed for extra protection and it’s quite tough. It is crafted from a durable aircraft grade aluminum, which makes it withstand the test of times. Unlike other sights, this one has a waterproof body, it’s also shock and fog-proof. This means you can take it to extreme conditions without fearing malfunction. I have tested it in 3 feet (1 meter) deep water and it doesn’t leak. It’s interesting to see the Motion Activated Illumination (MOTAC) which is the feature that stood out to me when it comes to performance. The MOTAC is designed to boosts the battery life by shutting down the system when not in use while at the same time activating the system at the slightest sensation of vibration or movement. In short: your sight will be activated once you move your gun. The battery lasts around 2500 hours, which means you will have enough power even if you go out hunting for a few days (CR 2032 battery). And another thing about the battery is side loading which means you can quickly replace the battery without removing the sight from the firearm. It includes a high 1.41-inch riser mount and standard lowered mount. It’s designed to mount on any pica tiny rail system. 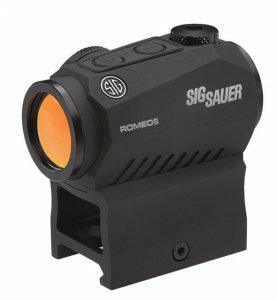 The Sig Sauer Romeo 5 is backed by a lifetime warranty covering any defects with the sight. What this means is that your optic is guaranteed forever. It gets better with the realization of the highly efficient, ultra-wide broadband, anti-reflection lens coatings that reduce surface reflections in low light levels across the visible spectrum. The advantage here is that you will it ensure maximum light transmission for a crisp clear image. The objective lens is another selling point. It’s 20mm, which makes it easy to see the image. On top of this, this objective lens is best for use with two eyes opened shooting style. This sight is parallax free which means the point of aim and the point of impact will remain the same. You will also take advantage of the unlimited eye relief this Sight offers, therefore, you can acquire the right aiming point and target no matter the position of your eye behind the sight. Another cool thing about the red dot reticle is the 10 different settings with 8 of these being for daylight and two of them designed for night vision. 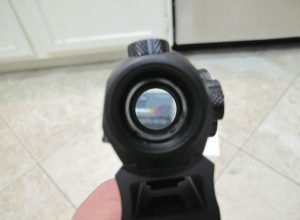 What to consider when buying yourself a red dot sight? Reticle type and pattern: all reticles will be illuminated in low light conditions but it is not a must for them to be red or simple. Besides, they can range from simple dots to multiple aiming points. So just understand the type of reticule, you want for your rifle in order to match your intended purpose. Battery and power: battery power illuminates the reticle in most red dot devices. So the battery life is an important consideration. Choose a sight with enhanced battery power to enhance your confidence. This will allow you to spend many hours outside before needing to replace or recharge. Weight: no matter how you want to use your scope the weight of the red dot sight can make all the difference. Weight affects the accuracy of your shot so you need a sight whose weight will not diminish the accuracy of your rifle. Dot size: you need a dot that is visible. A small dot will make it hard to for you to pick up the target quickly. Nevertheless, this does not mean you choose an overly large dot size because it is likely to obscure the target if you are shooting at greater distances. Durability: this ensures you get the value of your money. Check the construction and warranties to ensure it is in good condition. This Sig sauer Romeo 5 review establishes that this is one of the best red dots on the market in terms of performance and under low light conditions. It holds zero very well. It’s ratio price/quality is better than competing products of other companies, that’s why it’s such a popular choice. This red dot is reliable, strong, waterproof and great quality. It was a no-brainer for me. It will work fine but if you get a lower mount than what it comes with and have 2″ of available space to mount it on it would be more comfortable. I got this red dot 2 weeks ago. So far i love my Sig Sauer Romeo 5! Thanks for the in depth review.